They sent me a brand new Natrual Rubber Mat and 2 Cork Blocks. 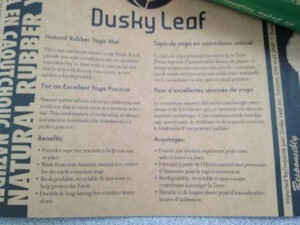 There are two really great things about Dusky Leaf. One is that they are a small Canadian company just like Namaste Yoga. Secondly they are a company that is all about environmental responsibility. Let me tell you a little bit about my Natural Rubber Yoga Mat. The rubber for this mat is naturally harvested, like maple syrup, The Dusky Leaf natural rubber yoga mat begins its life with a tree. Once it reaches maturity, the rubber tree naturally secretes a milky-white sap, the fluid which forms the basis of this yoga mat. That sap is gently extracted from the rubber tree just as a maple tree is tapped for its sweetness. The rubber tree is not harmed in harvesting process. Indeed, a rubber tree will usually enjoy a life span of about 25 to 30 years. For much of this period, the tree will continue producing sap, which can be made into many useful products for people to enjoy. As a yogi I appreciate that “stick” and “traction” that a natural rubber yoga mat provides. This natural rubber yoga mat provides one of the highest-traction surfaces available to any yoga practitioner. The superior degree of slip resistance is provided by the open-cell structure of the tree rubber. In addition, the natural rubber affords a level of cushioning and resilience that is rarely seen in a synthetic material. This combination of cushioning, resilience and traction constitutes the foundation of a perfect practice. So when you practice on a Dusky Leaf rubber yoga mat, you can focus less on what your mat is doing and more on the articulation of your practice. 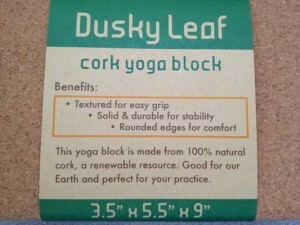 The real satisfaction of this package came from the cork blocks which are just of superior quality.This cork yoga block helps you hold those challenging poses longer. It is firmer than cheaper foam blocks and offers better grounding so you will feel secure. Its rounded edges and natural texture make for an easier and more comfortable grip. Again the blocks are made from natural cork, which is a renewable resource. This yoga block is the responsible choice for earth-conscious yoga lovers. Cork is derived from the bark of the cork oak tree. This oak tree develops a thick skin of cork every 9-12 years. Once a decade these layers are stripped from the tree in a process that actually promotes the health of the tree. Harvesting the cork does not involve cutting or harming the tree in any way. The tree regrows its bark many times in its long life, which averages between 150 to 250 years. 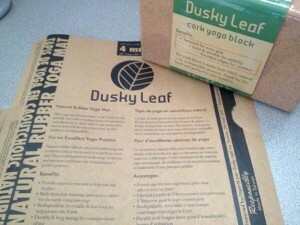 Go ahead and hop over to duskyleaf.ca for your yoga mats and blocks today. Next post: What other workouts do you do to look so fab? R u a vegetarian?